Chelsea say they are "astonished" after their request to freeze a transfer ban while they appeal was denied. The Blues have been banned from registering new players until January 2020 for breaking rules over the signing of foreign under-18 players. The Premier League club deny any wrongdoing and have appealed against the decision. But Fifa says it has denied measures which would see the transfer ban frozen during the appeal process. Chelsea were charged after Fifa said it found breaches in 29 cases of 92 investigated, including that of striker Bertrand Traore, now at Lyon. The Blues have also been fined £460,000, while the Football Association has been fined £390,000. In previous cases, involving Spanish clubs, Fifa has relaxed the measures so transfer bans were not enforced during the appeal process. "Chelsea Football Club is astonished by the Fifa appeal committee's decision not to suspend its sanction pending completion of the appeal process," read a statement. "So far as the club is aware, in all previous cases where a registration ban has been imposed by Fifa, a decision has also been made to suspend the sanction until the appeal process has been completed. "In this case, Chelsea considers that it is being treated inconsistently in comparison with other European clubs." The ban, which covers two transfer windows, does not prevent the release of players and will not apply to the club's women's and futsal teams. Based on documents from Football Leaks, French website Mediapart claimed in November 2018 that 19 Chelsea signings had been looked at during a three-year investigation and that 14 of those signings were of players under the age of 18. 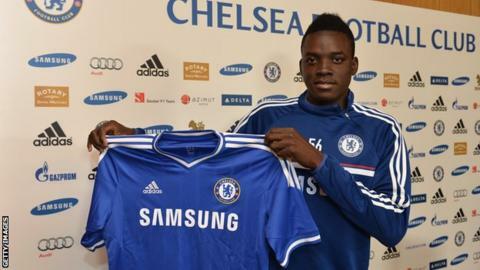 Burkina Faso international Traore signed his first professional contract at Chelsea in 2013, at the age of 18, but was not registered until January 2014. That deal, it is alleged by Mediapart, was for four and a half years, despite the limit for under-18s being three years. In addition, it is claimed Chelsea paid for Traore to attend the £20,000-a-year Whitgift School in Surrey. Real Madrid and Atletico Madrid both received bans for breaching rules over the signing of minors in early 2016, and fellow Spanish club Barcelona were given a 14-month ban after breaking rules for signing international under-18s in 2014. However, a Barcelona appeal saw their punishment pushed back a year, allowing the club to sign Luis Suarez, Ivan Rakitic, Jeremy Mathieu, Claudio Bravo and Marc-Andre ter Stegen.